Navy Special Boat Operators (SB) are also known as SWCC, which is an acronym for Special Warfare Combatant-craft Crewmen. 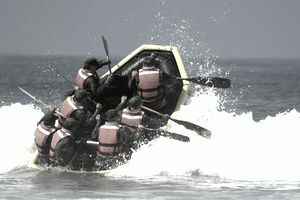 The members of SWCC drive a variety of Special Warfare craft. They support SEALs and other Special Operations Command forces during their maritime and riverine missions, and conduct unconventional small boat operations such as coastal/riverine patrols. SEAL Teams, SEAL Delivery Vehicle (SDV) Teams, and Special Boat Teams comprise the elite combat units of Naval Special Warfare, a service component of the United States Special Operations Command. These units are organized, trained, and equipped to conduct a variety of missions, including unconventional warfare, direct action, special reconnaissance, foreign internal defense, and counter-terrorism missions. They also support psychological and civil affairs operations in maritime and riverine environments. These highly trained specialists are deployed worldwide in support of National Command Authority objectives, conducting operations with other conventional and unconventional forces. Conducting maritime insertions/extractions of SEALS and other Special Operations Forces. Collecting information and intelligence on enemy military installations in coastal areas. Performing parachute/helicopter insertion operations in support of missions. Supporting military and civilian law enforcement agencies. SBs may be exposed to arctic, desert or jungle environments including survival in enemy controlled areas and all water conditions. They may also perform administrative and foreign training missions in a wide variety of climates throughout the world. Uncorrected vision can be no worse than 20/200 in each eye. Both eyes must be correctable to 20/20. You may request a waiver if you have had your vision corrected through a PRK/Lasik procedure. Not be under civil restraint, a substance abuser nor have a pattern of minor convictions or any non-minor, a misdemeanor, or felony convictions (waivers are granted depending on number and severity). This program is closed to women. The physical screening test is designed to assess the applicant's physical ability to undergo initial training. The test will be administered exactly as indicated. No waiver will be granted for failure to successfully complete the physical screening test. The run/swim times and push-up/sit-up/pull-up standards are minimum standards only. Maximum effort is required for all exercises and will be reported on the physical fitness screening test form submitted with your application. SB is open to new recruits under the SWCC-Challenge Program. The SWCC Challenge Program Option guarantees the opportunity to enter the Naval Special Warfare/SWCC community for individuals desiring a 4-year USN enlistment. This option provides for entry into Class "A" School. Applicants must volunteer for diving duty to become eligible for all training pipelines offered in Special Operations. Individuals can also volunteer for the program during basic training, or at any time during their career (up to age 30). Note: The Naval Special Warfare community is a sea-intensive community. Due to the unique nature of the special warfare mission, sailors in the elite communities of Navy Special Warfare Operator (SO) and Naval Special Warfare Boat Operator (SB) should expect to serve back-to-back sea tours prior to assignment ashore. Sailors in these communities can expect their initial back-to-back sea tours to be within the same geographic location, contingent upon the needs of the Navy and NSW. What Do Yeomen Do in the Navy?